Happy Thursday Everybody! I have a sweet treat for you today! I'm always on the lookout for blogs that stand out and are unique. I would like to introduce you to Rowena of the blog Rolala Loves. 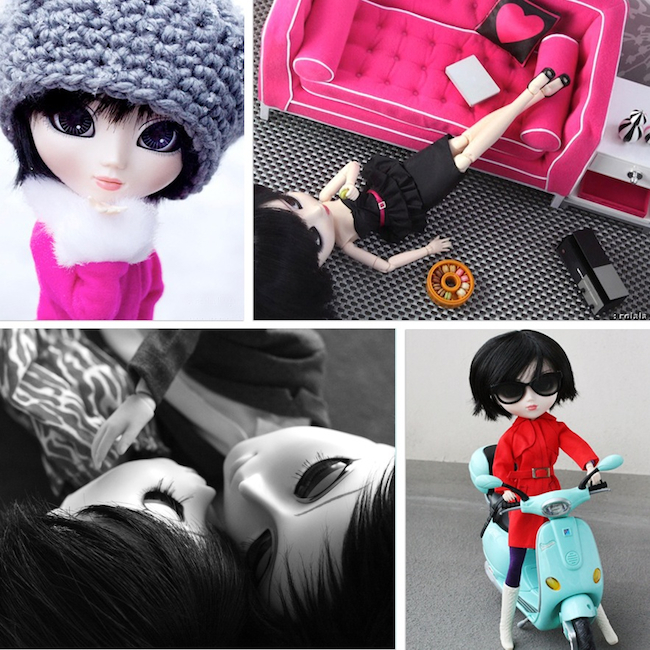 The 1st thing that caught my eye about her blog, was her use of a DOLL in her posts. Her doll Rena puts Barbie to shame! Mattel take note! Hi! This is Rowena from rolala loves. I'm beyond flattered that Kim is featuring my blog. I had started my page as a means to support my Etsy shop but it's grown into it's own entity. My blog covers a range of lifestyle topics from photography, food, fashion, beauty & design to tidbits about New York City. I feature my own original photography as well as photo inspirations. Being Asian, I like to share Asian editorials/celebrity pictorials because there's alot of beauty and creativity coming from the Far East which doesn't get much widespread exposure and it's something people won't necessarily see on other blogs. I also feature outfit posts with my Pullip doll/photo muse Rena cause she's very stylish. I hope anyone who visits will find something they'll enjoy and find interesting. Isn't she the cutest? I so want my own doll now! 3. Go to Rowena's Etsy Shop and tell me the name of the print you would like to win (max:$18)! Let me know in the comments section what you did to enter! Example: I follow A Very Sweet Blog on GFC, Facebook, Twitter, and Bloglovin. I follow Rolala on GFC, liked her FB page, favorited her Etsy Shop and I would like to WIN (name the print you would like to win). Rowena of Rolala Loves and Kim of A Very Sweet Blog. OMG I absolutely loved her blog! Thank you so much for sharing! She is SO cute! I need to check it out - thanks for sharing girl! will have to check out this lovely blog - thanks for the introduction. I love Rolala Loves! The images on Etsy are all very amazing and am having a hard time deciding which is my fave! I think my 2 faves are 'Mercer' or 'Be Still My Bleeding Heart'. Oh my! I have liked 'Certain Moments Photography by Rolala' on FB! Kim, you are so sweet featuring other bloggers to help them out! Yayyyy another giveaway Kim I am wondering if I can get lucky twice haha. I love the Dandelion picture so pretty. i like her site as well! nice feature! Kim: you ALWAYS find cool stuff to share. I absolutely love her blog, so unique. Her photographs are very artistic. Thanks for sharing Kim. Rowena has great style as does her doll! Of course I follow you both and Mercer or Mod Girl are my faces! i so love rowena's blog! adorable... love her blog too!!! Good luck to those who are entering the giveaway! Love Rolala's picture ^_^ :) her doll is so kawaii!! ahhh!! I follow both A Very Sweet Blog and Rolala on GFC and I would LOVE to win the Mercury and Chrylser print! I love Rowena and her blog--her Sitting in a Tree print is my favorite, although all of her prints are so pretty! I follow both of you here and on fb. 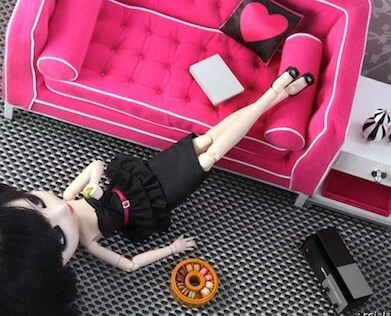 I love Rowena's blog and I think she does the best (doll) photography ever! Fab giveaway!!! Think I follow you on all but facebook as I don't have an account! Oh!! I love the Spring Blossoms picture. I follow you via GFC and I'm a new follower of Rolala via GFC! I also follow you on FB and twitter and I'm a new fan of Rolala on FB! I also added her Etsy shop to my favorites. Love this blog and the little beautiful doll, its such an inspiring blog to read and it features tons of asian editorials you won't come across anywhere else. i do editorial posts as well but sometimes i wonder where does she find all this beautiful editorials featuring asians? This is such a cute blog and I love her Etsy! The doll photos are too great and I can't get them out of my mind..... So creative and fun. Yay! Enter me, please! we are talking about two of my favorite blogs here. i follow rolala loves on GFC. my favorite items from Rowena's shop is "Flutter"
I love Rolala and I love seeing posts from the Far East. It's refreshing and there's a lot of creativity there! Have a great weekend! ps would love to be featured!! Thank you for introducing us to this wonderful blog Kim. She has a very unique blog. I follow you and Rolala on GFC. I also follow you on Bloglovin'. I would like to win the Mercer print. I love her blog so much, it´s always such an amazing source of inspiration! Thanks for featuring her, Kim! Oh. She is totally cute. Thanks for introducing us to her. Kim, thanks for introducing us to her!! And thanks for the giveaway! Love it! I'm already following A Very Sweet Blog on GFC, FB, and Bloglovin. I followed Rolala on GFC! I really like the Mercer print! I'd love to win Mercury and Chrysler! 1)I just followed her pretty blog via GFC, 2)I am a follower of yours already via GFC, :) and 3)I really really really like her Mercer print from her Etsy shop! Yes I love her blog too. Rolala is awesome! love her pics and dolls! I'm already following her google! Love the print Mod Girl from her shop! I am just surfing Internet and found this more beautiful blog over here. I have seen all the images that the post here. It just awesome, and you are right that article that you have post here is really unique and creative.